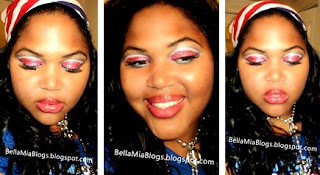 Bella Mia Blogs: Independence Day Diva! Fire up the grill and light those sparklers! This fun lil look will have you singing "Stars and Stripes Forever" well after the fireworks have burnt out! Show your American pride this 4th of July with this beautiful red, white and blue makeup! Love my babies sooo much! k, I'll stop gushing now lol! Subscribe to my YouTube Channel for no dinero! Have a safe, fun, beautiful, memorable, lovable, fantastic, gorgeous Independence Day, everyone!! NYX Jumbo Eye Pencil in "Cherry"
ELF Cream Eyeliner in "White"
Wet 'n' Wild Cream Eye Shadow Pencil in "Electro"
BH Cosmetics 120 palette 2nd ed. ELF Cream Eyeliner in "black"
Maybeline Define-a-Lash Mascara in "Brownish Black"
NYX Mosaic Blush Powder in "Peachy"
NYX Brush on Gloss in "Red Lips"